Pictured, from left, Cory Benz, owner and funeral director at Titus; and Anne Petre of Parkview Warsaw YMCA. 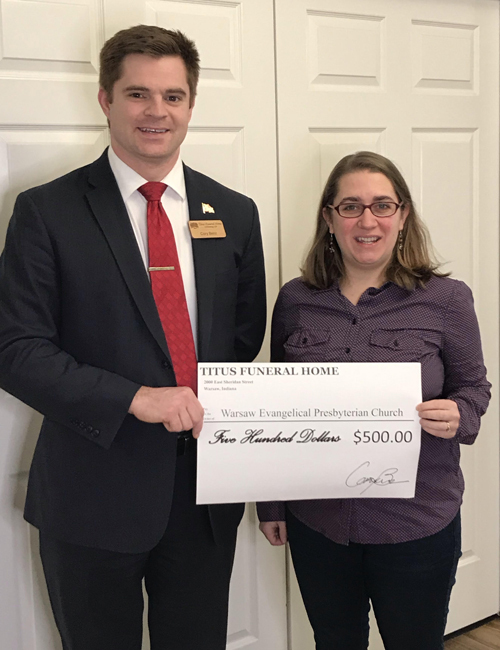 WARSAW — Tim Tebow Foundation recently received a $500 donation from Titus Funeral Home. Night to Shine is an unforgettable prom night experience, centered on God’s love, for people with special needs ages 14 and older. Today Feb. 8, 2019, Night to Shine will celebrate its fifth anniversary. On one night, 655 churches from around the world come together to host Night to Shine for approximately 100,000 honored guests through the support of 200,000 volunteers. Titus Funeral Home is proud to be able to donate to this event. “There is so much joy and love, and it just makes you want to be a part of the event. Night to Shine truly brings a community together,” says Benz.